In years past, I’ve gone very big when decorating for the holidays (my most epic tree lives on and on and on thanks to Pinterest). But now that we’re in our house, I’m trying to settle in on a more streamlined style. It’s funny. Even though we have a lot more space, I want to have a lot less. And that includes holiday decor. I don’t need to store boxes and boxes of crap stuff that I only look at for 30 days a year. I’m vibing on minimal holiday decor this season. I stumbled upon this stunning Scandinavian home that totally epitomizes my vision. It’s not surprising. It’s owned by the founder of Norm Architects, one of my major design muses. I’m immediately envious of this home’s gorgeous sanded concrete floors. That’s what I desperately wanted to do in our house, but I didn’t win that design fight. Le sigh. But I digress. I’m really loving the subtle, chic nods to the holiday season sprinkled throughout the space. As you look around this house, little holiday touches adorn each room. A tree that looks as if it was plucked from the Danish forrest surrounding the property. 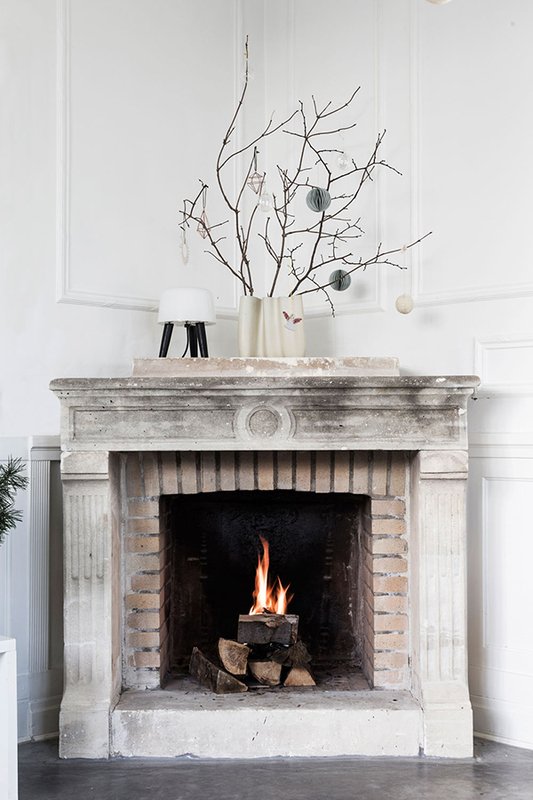 Branches on a mantel dotted with chic, modern ornaments. Packages wrapped up in brown packing paper and tied with red string lay against the wall. Candlelight is everywhere. The owner explains that he relies on elements of nature to imbue his rooms with the holiday vibe. He wants the festive touches to feel like part of the room’s natural decor. A perfect example is the tray of moss and thick pillar candles on the dining room table. It adds a cozy adornment without any of the holiday cheese factor. Simple bits of greenery – in one case laid across a vase rather than in it in the pic above – or a potted tree atop the kitchen table give a nod & a wink to the season. I realize this shunning of glitter and gobs of red and green might seem a little harsh, but I love the striking, cozy mood it creates. Every element of a room has meaning to the family who inhabits it. Your holiday stuff doesn’t have to be in your face. And the post-holiday clean up would be a breeze! I know this is the antithesis of the HGTV crowd (how many Pier One ads did I see during last night’s Fixer Upper premier?! ), but I am diggin’ this look big time. While our house is far from ready for prime time at the moment, I’ll share some sneak peeks on Instagram (you can follow me here) once I get to decking these halls. It isn’t December 1st quite yet so I feel a little less guilty. For more holiday decorating inspiration CLICK HERE and HERE. I would not like concrete floors unless I had radiant heating in them. I did have concrete floors for a few years, but I was living in Africa and temperature wasn’t an issue. Certainly convenient for cleaning. I like the toned-down approach to Christmas decor, although I like lights on the tree and decorations that represent our Christmases past. I take a pass on buying all-new, color-coordinated decorations every year. Oooh this home is all kinds of spectacular! I’m in love with this way of decorating for the holidays. So much more sophisticated and cozy. This is lovely but it helps a lot that this home is entirely monochrome. The minimal decor pops in all the white and grey in a way that’s very pleasing. My home is sparse and pretty monochrome – due in part to the fact that I just went from an apartment to a house 🙂 the old owners went with monochromatic, light colors probably to sell. Too many decorations look garish in a space like that. For people who have lots of strong color in their homes, or a lot of personal decor year round, these small touches would get lost. Love the minimal look of this home! Perfect for the holiday season.